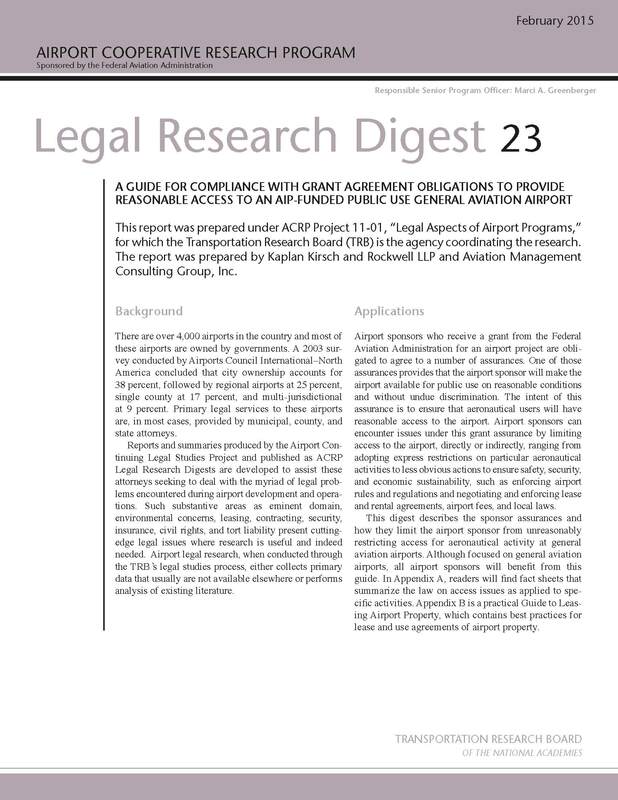 On February 6, 2015, the Transportation Research Board published Legal Research Digest 23: A Guide for Compliance with Grant Agreement Obligations to Provide Reasonable Access to an AIP-Funded Public Use General Aviation Airport by Kaplan Kirsch & Rockwell, in cooperation with Aviation Management Consulting Group, Inc. The obligation to provide reasonable access is a fundamental requirement for federally-obligated airports and is implicated in issues as diverse as leases, noise rules, and parachute landing areas. To help general aviation airport operators understand their obligations in this complex area, the Digest contains a comprehensive overview of a general aviation airport operator’s legal obligation to provide access and specific discussions of how those general legal obligations apply in specific contexts that airport operators regularly face.